Moving from one year to the next is often a time of reflection. What did we do in the last year? How did we do? Did we reach our goals? What do we want do achieve in the coming year? Where do we want to go? In terms of bushcraft skills, some of us can have lofty goals, while others don’t really think of wilderness skills and structured self-improvement in the same mental space at all. Over the years, I’ve tried and failed at enough activities as well as achieved varying levels of success versus numerous goals to gain some understanding of what makes for sensible goal setting for the coming year. Given I am an outdoor professional in various different interlinked areas – a mountain leader and a canoe leader as well as a bushcraft instructor – I have a broad understanding of what works in terms of efficiently and effectively moving one’s outdoor skills forwards. I hope the following helps you move your skills forwards over the coming 12 months. Rome wasn’t built in a day, so goes the old cliche. But there is truth in this statement. Easy, simple, facile techniques and tricks can be gained in a day. Everything else takes longer. If you attempt more involved learning processes in a day, you will more likely fail than succeed. Big goals, hard skills, and large subject matters can be difficult to get your arms around. They can be daunting. The sheer scope of getting to grips with them can put you off before you start. The answer is little and often. Chip away at the block. Don’t bite off more than you can chew in any given day. I saw a sign in a gym, which stated “In a year’s time, you’ll wish you started today”. This is hardly a Zen koan but it is certainly worth pondering in the context of developing capabilities that necessarily require consistent application over a period of time. We all like doing things we enjoy. We are not so attracted to doing things we find difficult. Moreover, we tend to enjoy things we are good at. Here, then, it’s easily to create a positive feedback loop. It’s very easy to become stuck in a comfort rut of doing stuff we are good at. We avoid things we are bad at (or not yet good at, if you want to frame it more positively). Learning anything worth learning is necessarily hard. It’s certainly harder than sliding down the well-greased groove of something at which we are already proficient. The way you expand your overall capability, however, is to spend a large proportion of your training time working on your weaknesses (which is hard), while spending a small proportion of training time on maintaining what you are already good at (which is easy). Goals shouldn’t be too easy, otherwise they don’t really stretch us beyond what we can already do, and we stay in our comfort zone. Equally, our goals should not be so pie-in-the-sky that we don’t believe we’ll ever attain them. It’s well documented that setting targets for sales teams too high can be counterproductive. This is not specific to sales or salespeople; it’s basic human psychology. So, this principle extends to other fields of endeavour too. The trick is to set short-term goals at a ridiculously achievable level, then repeat the process regularly, building on the small thing you built before. See “little and often” above. A simple example is to compare the prospect of learning 52 knots with learning a new knot per week, with 7 days to concentrate on each one. Sitting down to learn 50 knots is difficult. 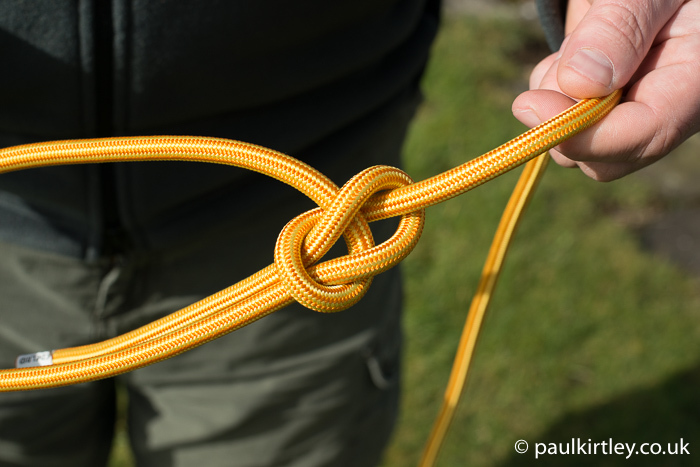 Learning one knot per week, though, is perfectly manageable… Photo: Paul Kirtley. When setting goals, we have the tendency to focus on the outcome. I’ll use bow-drill friction fire-lighting as an example. Someone has the goal of creating a fire by bow-drill. This is an outcome goal. Fire by friction. A higher goal would be to consistently produce fire by friction using a specific species of wood. Consistent achievement rather than doing it once. Doing something once is not mastery, by the way. A higher goal still would be to consistently produce fire by friction using a range of different species of wood. For more on goal-setting in bow-drill practise, listen to this podcast. The linkage between all of these goals is process. It’s often process that is neglected. On an Elementary course, I will demonstrate making a bow-drill set, then proceed to use it to generate an ember, before taking this ember to some natural tinder materials, which I will blow to flame. Students will then invariably try to replicate the end result (flame) as rapidly as they can. This will involve a lot of grunting and sweating with sub-optimal bow-drill sets they have made. This is despite us adding to the basic demonstration with an explication of the pieces of the set as well as specifying ideal dimensions for them. It seems that this is part of the learning. Repeated attempts from first principles improves the process. It’s working on the process intentionally that improves the process. Ultimately it’s having the process down that yields consistent results. 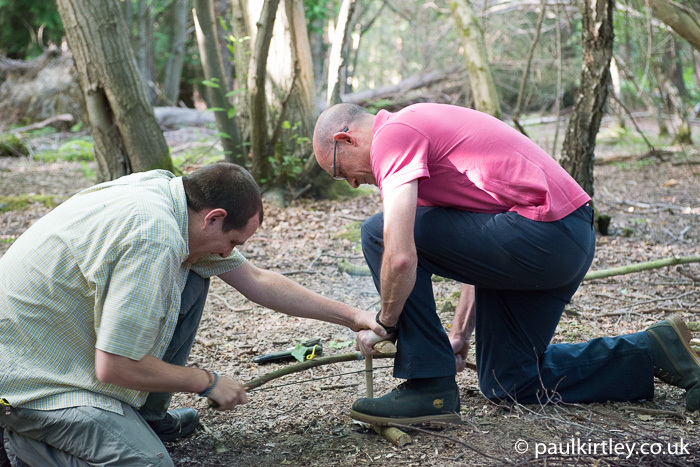 Might teaming up with a friend help you make the bushcraft breakthroughs you are seeking in the coming year? Photo: Paul Kirtley. Focus on the processes – selecting high quality materials of a good consistency (not too hard, not too soft), making the drill straight and perfectly round, sharp at the top, blunt at the bottom, as well as ensuring the tinder bundle is dry, consisting of sufficiently fine materials and in large enough in volume are all parts of the process which lead to greater success in the desired end result. Consistently applying the processes also results in greater consistency in the end goal. The willingness to focus on processes is important, not just the desire for the end result. 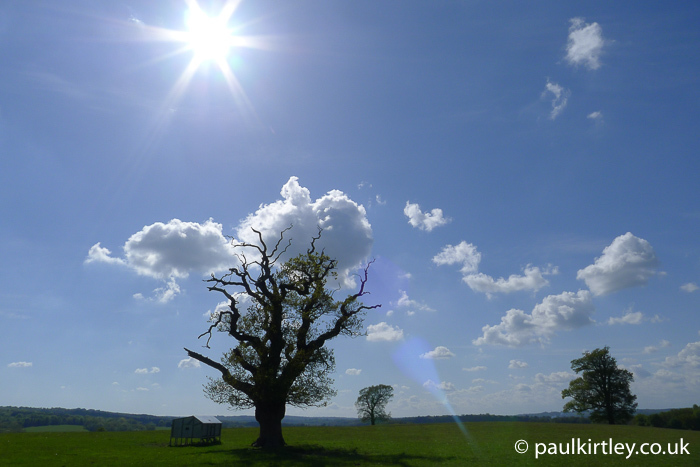 At the heart of Bushcraft is a practical study of nature. To be able to use any plant or tree for any purpose, you first have to identify it. Granted, many woods will burn quite well but beyond identifying a material as dead, dry wood, there is some nuance required, even within the context of burning fuel. Which woods burns quickly, producing a lot of flame for quick boils or signal fires? Which woods generates a lot of sustained heat and embers? Which woods produce less smoke, for use within shelters? Which woods are good (and safe) for smoking meats and fish? Which woods are best avoided for any of the above? In order to apply this knowledge, you have to be able to identify the relevant species. And that’s just some aspects of burning wood. There are layers of nuance to selecting suitable, combustible dead-standing wood. Photo: Paul Kirtley. 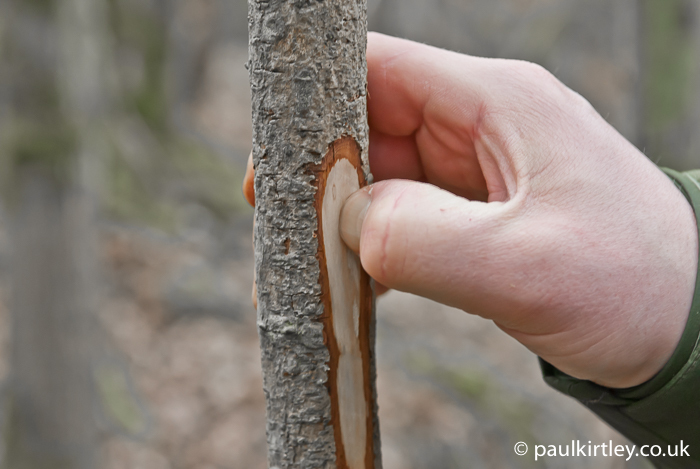 Which trees have bark that is suitable for making containers and baskets? 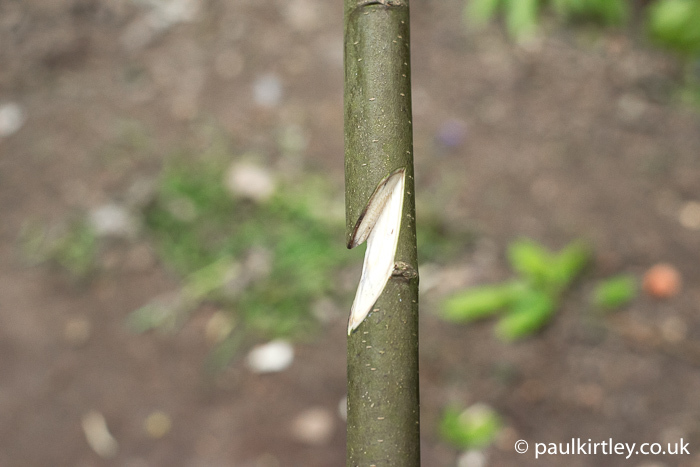 Which trees and plants can yield fibres for making strong, durable cordage? Clearly when foraging for plant foods, your identification skills must be solid. Nothing should be going into your mouth for ingestion unless you are 100% sure of what the species is. Yes, a practical skill level is required to apply bushcraft skills but the fundamental skill, the part which comes first in any of the processes mentioned here is the correct identification of the relevant resource. At the heart of bushcraft is a study of nature, natural resources and how to identify them. Photo: Paul Kirtley. You need to get out there. More often. Land access does get in the way. I’m not discounting this. But it is possible to find places you can go regularly to camp in the woods. Also, in the UK, there is an established culture of wild camping on the elevated ground of hills, moors, fells and mountains of this varied isle. Read my article on How To Find A Place To Practice Bushcraft In The U.K. 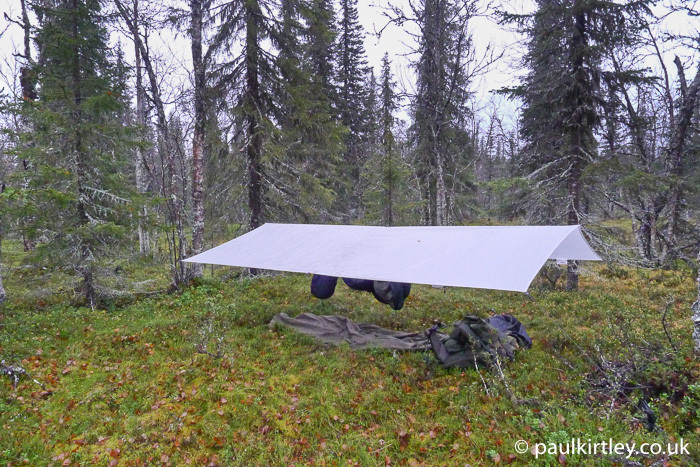 Yes, you might have to modify the way you set up your tarp. Or you might have to use a tent in some places. But just get out there. Walk into the wilds, set up camp and spend the night there. It’s good for your bushcraft soul. So, promise me this, whatever level of experience you are, plan some nights out over the coming year. Some readers may have never spend a night out before. There’s nothing to be frightened of (or ashamed of). The best sleep I have is outside. There is nothing to worry about. Plan some overnighters. 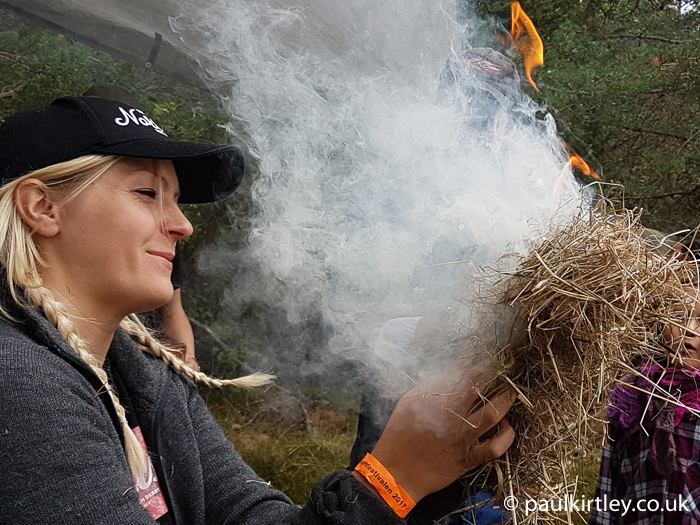 As well as asking where you are taking your bushcraft skills this year, you should also ask where your bushcraft skills can take you… Photo: Paul Kirtley. If you are more experienced, plan to camp out for at least a night or two each season – spring, summer, autumn and winter. If you are used to camping in the woods, get into the hills. And if you are used to camping in the hills, find some woods to camp in and have a campfire. I receive a lot of questions regarding water. Some people won’t camp out because they worry about water. We have a basic need of 3-5 litres per day and if you are going to spend any time moving through a landscape, camping out, even for a night, you need to get to grips with water purification. It’s not difficult if you strip it down to first principles and make the effort to understand the problem you are trying to solve in producing potable water for yourself. A bit of research and you will be up to speed. The you can start to apply this knowledge on your overnight camps. 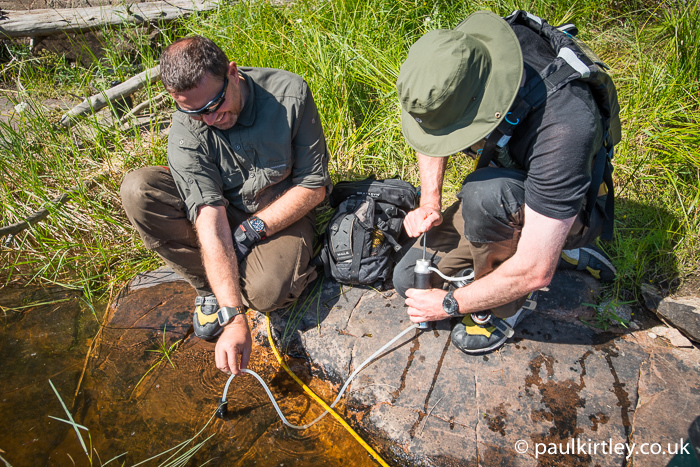 Build up an understanding of the pollutants you can face in the water you source, as well as a solid set of protocols for dealing with them. Photo: Paul Kirtley. MREs, boil in the bag, sausages and beans, seem to be the lowest common denominator. You can vary your campfire food so much more, though. Even with very basic cooking equipment, you can create delicious one-pot meals from fresh ingredients. These can be purchased and taken with you. Later, as your ID skills improve, you can add foraged ingredients. In a single stainless steel cooking pot or billy can over the campfire, I can cook a meal some people would not think of producing at home. Indeed, I have taught guys and girls to cook meals over a fire, who have never cooked anything other than ready meals at home. But they loved the freedom of cooking from scratch and using a campfire to do so. Delicious meals can be cooked on even in a single pot. Photo: Paul Kirtley. If you want to accelerate your cooking abilities, then of course lots of cooking outdoors will help, but also consider experimenting with recipes at home. 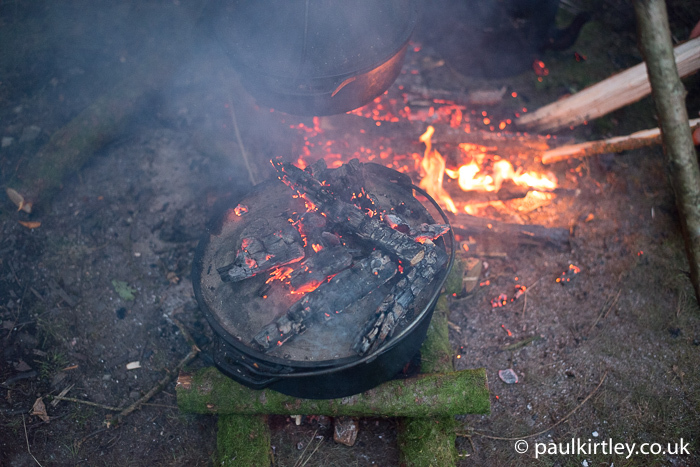 Pretty much all of the recipes I cook on expeditions were practised at home first, then taken to the woods and cooked over a campfire, honed, simplified, optimised for the context. Anyone who has come on a canoe trip with me can tell you how much flavoursome good food can be produced in an overnight camp. Then, of course, you can go large. Adding more complex meals to your repertoire, roasting joints of meat – over the fire or in Dutch Ovens – creating elaborate multi-pot meals, baking bread, Yorkshire puddings and anything you might think of taking out of a recipe book at home, can be done on the campfire by building up experience, step by step, over time. Build your campfire cookery skills from the basics up to more elaborate meals. 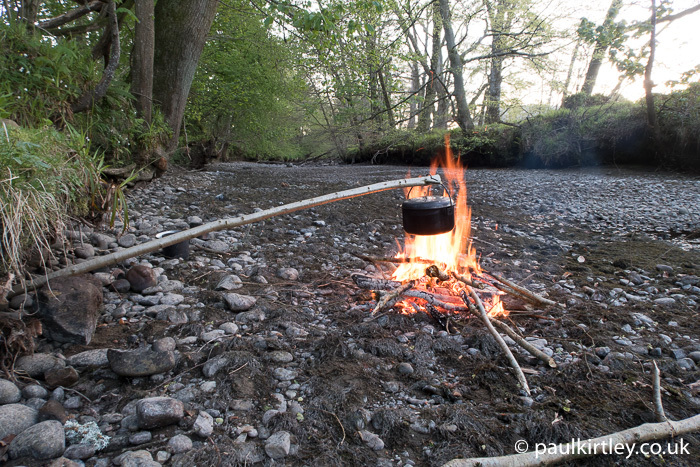 Anything you can cook at home, you can cook in the woods… Photo: Paul Kirtley. This follows on from the previous sections with regards to tree and plant identification as well as campfire cookery. Once your ID skills are up to scratch and you can cook, then there is nothing to stop you cooking with wild ingredients found while out and about. This isn’t a new concept. 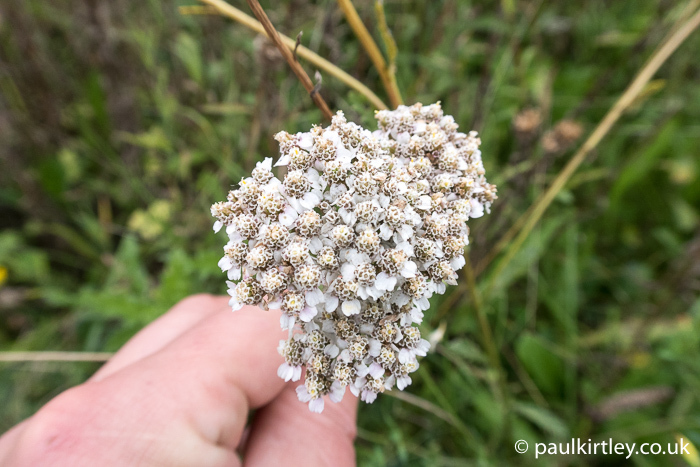 Indeed foraging for wild foods is an area of interest that has received a lot of attention in the last decade or so. There is a lot of goodness out there in the woods, fields and hedgerows. Of course you need to be careful not to poison yourself. With respect to this point, the species to concentrate on are the poisonous species of trees and plants that look similar to edible species. This may sound obvious but this is where you are most likely to go wrong. There are many species of trees and plants which are edible in some way. There are some notoriously poisonous plants which look nothing like edible species. It’s the poisonous species that look like edible species which cause the issues but there are not so many of these. 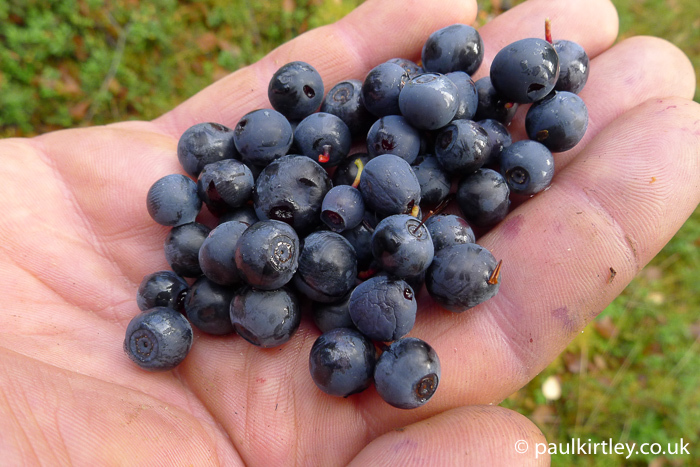 If you fancy foraging some wild edibles, a good place to start is easily identifiable berries. The best berries tend to be tasty straight off the bush, require little or no processing and can be collected legally in good quantities. And if you want to start to include them in your campfire cooking, how about adding some blackberries or blaeberries to a bannock or muffins? 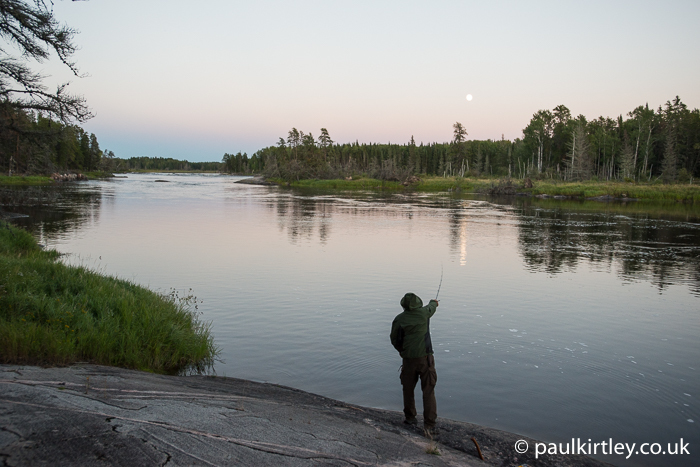 Even among otherwise relatively experienced foragers, fishing is not always a well-developed skill. Of course there are many skilful anglers out there but they tend to focus solely on fishing. The challenge for you as a bushcraft person is to build up the fishing skills to be able to augment all the other ways you might have of feeding yourself from the wilds. 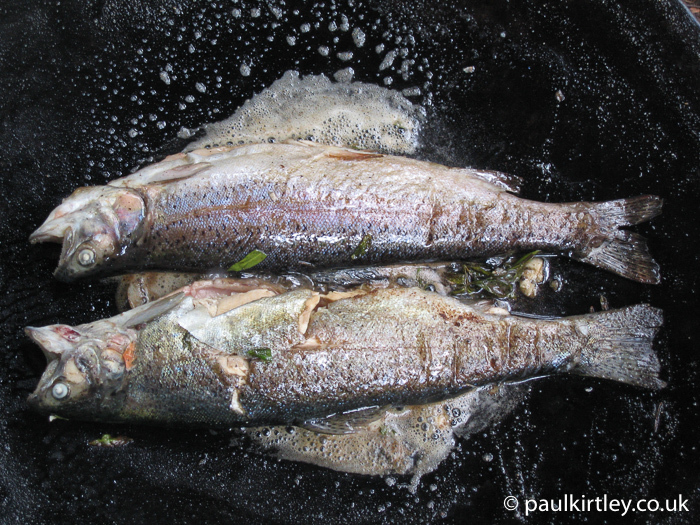 Besides, it’s hard to beat fresh fish pan-fried or cooked directly over the fire. Fishing is easily accessible, relaxing and can put food on your plate. Photo: Paul Kirtley. All freshwater fish are edible. Some taste better than others, though. Fish are a great source of protein and essential fatty acids. While there are rules around fishing inland and typically a licence is required, fishing around the coast is generally less regulated and also a great way to augment your diet. Find a friend or colleague who is an angler (you are bound to know someone who goes fishing) and get them to take you out, show you the ropes. Even if you are fishing with barbless hooks for catch and release, you are gaining experience and developing a skill set. It’s hard to beat the taste of freshly caught and quickly pan-fried trout. Photo: Paul Kirtley. Moss on trees. Termite mounds. There’s plenty of snippets of pub knowledge around natural navigation. Finding your way through wild country without map or compass (or GPS) is a different matter though. It’s a daunting prospect. The fundamental building blocks of natural navigation understanding you should have are relatively straightforward to determine, though. First off you should understand the motion of the sun. What does it do each day? Where does it rise, where does it set, when is it at its highest point? How do these things vary through the year? You can begin to understand this through observation (N.B. little and often) and perhaps a little reading. Understanding the motion of sun is a fundamental building block of natural navigation. Photo: Paul Kirtley. Next understand what the moon can tell you about direction. Understand that the illuminated part of the moon is illuminated by the sun. If you understand the motion of the sun then even when it is below the horizon, the moon can help you a good deal if you can relate the two. The moon has its own cycle, completed over 28 days. Again, being out, observing – little and often – will help build up a mental database of observation. 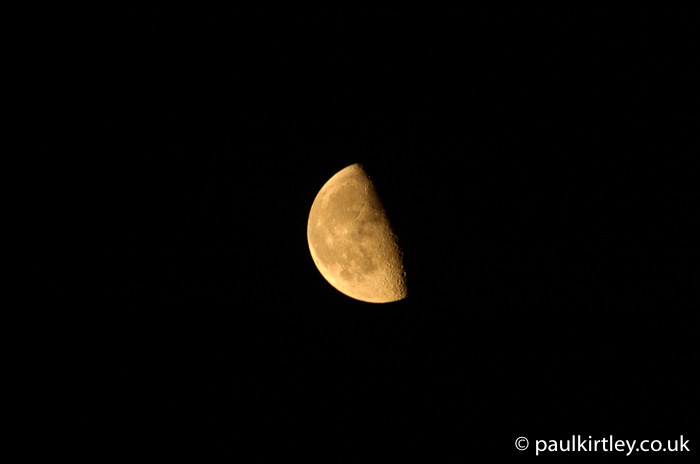 Build on your knowledge of the motion of the sun by observing the illumination of the moon. Photo: Paul Kirtley. Then you have the stars, some of which are the next brightest objects in the night sky after the moon. Some of these can be very useful to you. Finally, in each hemisphere you have a star or constellation that gives you one of your cardinal directions – Polaris in the north and the Southern Cross in the south – from which you can ascertain the other directions. Build up a familiarity with all of the above building blocks of natural navigation and finding your way without map or compass – day or night – begins to seem a lot less daunting. Fire lighting is a big subject. It’s a major cornerstone of bushcraft and survival. There is much to learn. We all have our favourite ways of lighting fire. My advice for improving your abilities is to work on areas you don’t normally use. Bear in mind my comments in the introduction to this article with regards to working on your weaknesses. We all have them. Which areas of fire lighting are you least comfortable with? Work on those. Are you any good at feathersticks? 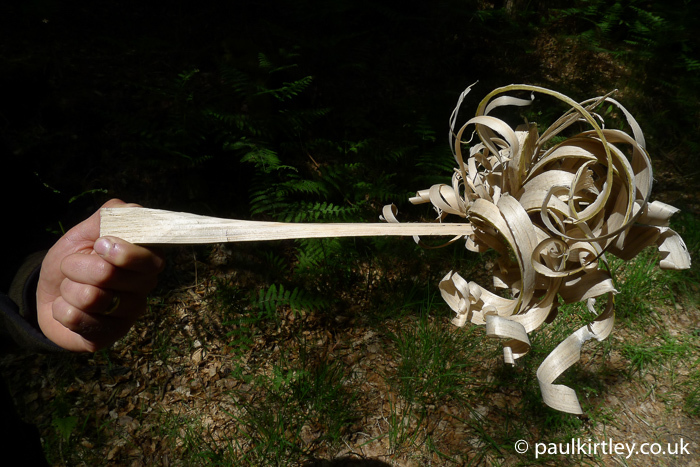 Feathersticks not only increase your range of fire lighting skills but practising the technique of carving them also improves your knife skills. Work on your weaknesses. How good are you at making feathersticks? Photo: Paul Kirtley. I understand you might never use bow-drill on a canoe trip but being good at taking an ember to flame to an established fire makes all the rest of your fire-lighting better and more certain. Or mix things up a bit, by trying techniques in ways you’ve not done before for example a two-person bow-drill. Team up with a friend and work on the possibilities. Make it your business to light fires in new ways or using new materials. Photo: Paul Kirtley. I mentioned above, that once you get beyond burning dead wood, identification of natural materials becomes more nuanced. So does some of the processing. Exploring the world through learning how to identify, process and use natural materials is a very rewarding one. This also gives you a host of practical skills, the ability to fashion items for your own use and a reduction in dependence on manufactured goods. 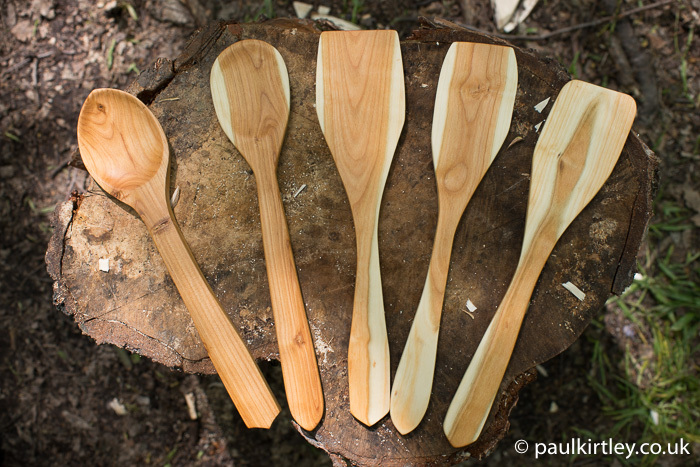 Hand-carving a set of utensils is not only satisfying in itself, you also develop woodcrafting techniques that allow you to make what you want, when you want. Photo: Paul Kirtley. 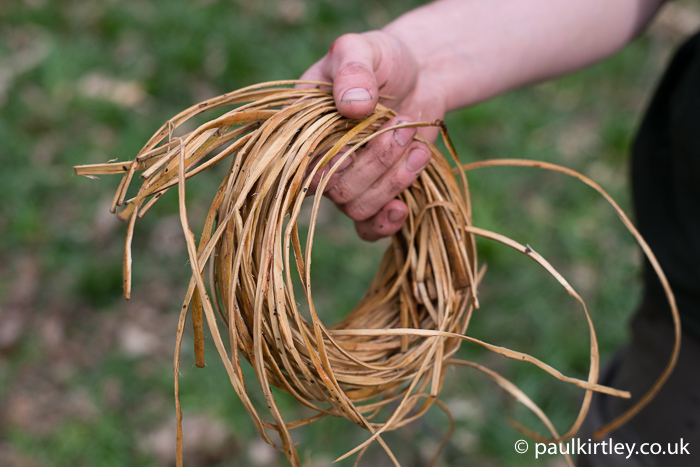 Why not start your exploration of natural materials by learning some basic methods of how to make cordage from natural fibres, then explore the range of fibres available to you. Some will be present year-round, others will be better used in spring, others more available in autumn/fall. Again this is one of those little-and-often skills. You can also extend into using bark for containers, solid or woven. There are endless avenues to explore in using natural materials and this study definitely puts the craft in bushcraft. Explore the selection, processing and use of as many natural materials as possible. Photo: Paul Kirtley. Along with tree and plant identification, an area in which many people lack confidence is knot-tying. There are a couple of elements to this. Some people genuinely don’t know many knots beyond how to tie their shoelaces and don’t know where to start in learning more. Others among the readers might have learned how to tie a few knots but don’t really know how to apply them. Knowing how to tie knots in isolation of any application is a very common situation. First, I would recommend learning how to tie knots such as overhand, figure of eight, reef knot, bowline, clove hitch, round turn and two half hitches, fisherman’s knot, and maybe some useful tarp knots. For more videos like the one above, subscribe to my YouTube channel here. Learning knots is not as painful as you might think if you take it slow and steady. Learn one or two a week then look for ways to use them in everything you do. Play around with them and make them yours. There’s a difference between just doing something and doing something well. I could refer back to my bow-drill example earlier in the article. Focussing on detail is very important in order to achieve success in some areas. In other areas, refinement and attention to detail don’t necessarily dictate the dividing line between success and failure, but they do make a big difference to efficiency or reliability. From a well-made spoon to tightly laid-up cordage to a refined featherstick to an elegant pot hanger to a neatly filleted fish, there’s a common physical aesthetic, which is pleasing as well as practical. Once you have the basics in place, go for refinement, go for finesse. It’s what makes a true bushcrafter. Aim for refinement in all of your bushcraft. Photo: Paul Kirtley. BEFORE YOU GO – Do you want to be more active with your skills? Do you want to take your bushcraft skills on a journey? 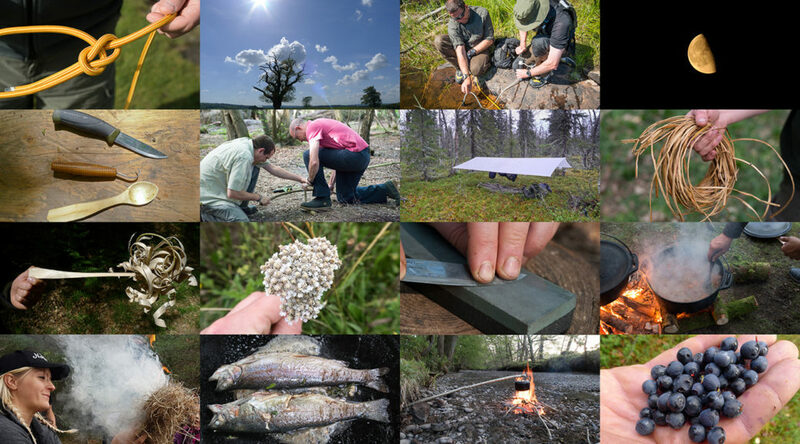 Check out my FREE presentation Real World Expeditioning With Bushcraft Slills AND get a load of FREE resources that go with it. Enjoy! An earlier version of the above article originally appeared in Bushcraft & Survival Skills Magazine. Superb article, Paul, both in content and clarity. It has been too long since my last bush-craft course, for all the usual reasons, but this has inspired me to ‘get out there’ again. Great and inspiring article Paul, loads to think about for the coming year. I have been guilty many times of looking at the end result and missing the details, I learnt that on the intermediate course when watching Spoons and Henry work together on the bowdrill, it opened my eyes and made me want to not fail like this again. My long term goal this year is to get to grips with my tree and plant ID, as you know I have been on the online course for several year but failed to keep consistently studying thought the year. Something that I have already been working on is to do little and often, I am sure if I continue like this for a year (currently mid Jan I know) I will reach the end and be glad I took the time to study this subject in detail. So much of what we want to do all falls back to this subject, I know this is the root cause for most of my weaknesses. As my ID of trees and plants grow I aim to increase my knowledge of uses, which I can build on in coming years. My short term goals is fire lighting using a variety of methods and materials. My weakness again is what wood to best burn in a given situation… and feather sticks. As you say its important to set realistic goals, for me this is key, last year I set lots of small goals rather than trying to take on a huge task. Last year was a good year, I lost a good amount of weight and I attempted things I had been too afraid of before, I got out of the woodland and I climbed a mountain (first of many I hope), attempted and failed to walk a ridgeway (completing 42 miles out of 87), I slept up in the hills and walked on moorlands. These are what I look back on as the details of last year, each success or failure slowing building up knowledge, skills, strength and weaknesses. I don’t think anyone should be ashamed of weakness as it isn’t a failing just an opportunity for improvement, embrace them and learn from them. Good illustrations with the pictures, and a lot of good ideas mixed with encouragement to practice, practice, practice. Thanks! Now, as for the rest of the article, a filter, such as a paper coffee filter, on the end of the hose when pumping and filtering water will help pre-filter the water, keep out larger debris, and allow the actual filer to operate longer and with less maintenance. As tall as the flames are under the hanging pot I would expect the branch that the pot is hanging from to weaken and the pot to fall, and the meal to go to waste. Set the pan or skillet on dry rocks or larger wood .that way your not hanging from a tree. I’m 68 years old. I’ve been exploring bushcraft and survival skills for 30 years. Congrats Paul. This is by far the best primer for newbies or skilled. Good, inspiring article Paul. As always, thanks. good tips and advice thanks!! Another great article. I have been following your YouTube channel for some time now and just recently started listening to podcasts (there are many to catch up on I see), however this is the first time I have sent you a comment. I wanted to point out how your humble views, you vast guest knowledge base, and your keep it simple attitude has kept me as a big admirer. I have had the privilege to meet Kevin Callan this January at the Frostbite Winter Bushcraft Symposium here in Alberta and he also had great things to say about you. Your last podcast with Anna was truly fascinating, especially since the birch here is Canada’s life giving force when is comes to fire etc. I have also heard that you will be attending the 2019 Bushcraft Symposium in which I am looking forward to meeting one of my cyber mentors and hope to learn more from yourself and the many other global wilderness mentors. Thank you for keeping it simple, real, and exciting. BTW I love your rants you get onto, keeping your honesty and love for outdoors as priority. See you this June. Thanks for your positive and supportive words. I’m glad my material here and on my YouTube channel has been of benefit (and enjoyment) to you. I’m glad you got to meet Kevin. He’s a great guy. Full of energy and enthusiasm for the outdoors and getting others involved with the outdoors. Thank you for all the content you supply free of charge. Some of us are not fortunate enough to be able to afford to attend a course, but with the material you supply we can at least “have a go” knowing we have been given the advice by a true expert. Most of the suggestions you have made above are areas I intend on improving this year, and I am bringing my 6 year old daughter, 4 year old son, and my wife along on the journey. We have already begun with fire lighting (small flame to large), and fungi identification (daldinia concentrica and comes fomentarius so far) whilst also concentrating on their uses. Most of the information and knowledge base I work from comes from you, as I know you wouldn’t be putting it out there just as a filler.